The beauty of the Bay of Naples, in addition to its splendid half-moon shape framed by Vesuvius is also given by three masterpieces of nature: Capri, Ischia and Procida. The three islands are a destination for those who want to get away from the city and want to immerse yourself in nature, enjoy the sea and participate in cultural events. The islands of the gulf are obviously places of worship also from the gastronomic point of view. You can not miss a taste of typical dishes, or one of the thousand delights of pastry that the islands offer. Gourmets will never be disappointed. 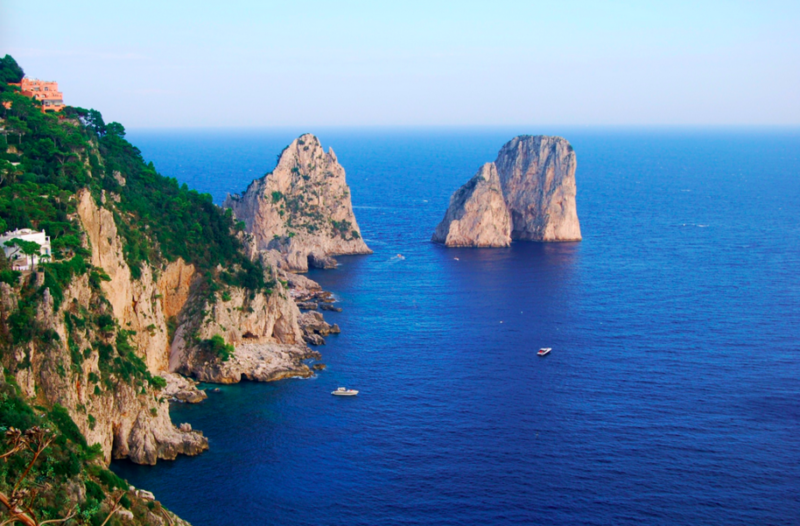 Capri is an island with a thousand colors, as many as the places and interesting things to see during your visit. Even before your arrival to the island, the Faraglioni Rocks, enormous rocks guarding the blue sea in front of Capri, greet you. They have become the main symbol of the island. Emblem of nightlife and glamour and town hub, the Piazzetta di Capri is the ideal place to taste a coffee and relax. Visit then Villa Jovis, villa chosen by the Emperor for his holidays: its ruins testify that already in ancient times Capri was chosen as VIP holiday destination. One of the best ways to visit it is by boat: a tour around the island, a stop at the Blue Grotto where the sea becomes a bright sapphire. The main beaches are Marina Piccola and Punta Carena with its Lighthouse. Among the buildings of historic and artistic value, we mention the medieval Certosa di San Giacomo, Villa San Michele, Villa Damecuta and the Augustus Gardens and Via Krupp, terraced gardens with a breathtaking view with a road set in the rocky ridge overlooking the sea. Capri is also a must for its cuisine. Gourmets will not be disappointed. Ischia is the largest of the islands; vast and morphologically diverse, it welcomes about 6 million visitors annually. Among the six municipalities that it comprises, the most extensive is Ischia Commune, divided into two parts: Ischia Ponte is its evocative historic center marked by ancient paths and bottegas, while Ischia Porto is a tiny fishing village. The Aragonese Castle in Ischia Ponte, constructed by the tyrant Hiero of Syracuse in 474 B.C., is the most-visited monument on the entire Island. Be sure not to miss the Cathedral di Santa Maria Assunta where, in 1509, Ferrante d’Avalos and Vittoria Colonna exchanged their vows. Inside is a crypt holding frescoes by the Giotto school painters. Ischia is famous for its thermal water which is used in thermal parks & gardens and natural spas. They are appreciated throughout the world. Procida with an area of about 4 sq.km both mermaid and pearl in the Gulf of Naples. An island to discover. Come for the first time, always come back gladly. Today like yesterday, Procida is a succession of colorful houses, ancient palaces, breathtaking views, vineyards, lemon trees, and then sandy beaches, creeks, paths, narrow streets, nature, blue sea, seagulls, scents, colors and flavors. It is not an island, it is not a rock, it is a jewel resting on the sea.Quiet, mysterious, with its slow rhythms, far from the worldliness and chaos of the nearby islands, Procida is the destination of lovers of simplicity, tradition, quiet. Procida emotions, inspirations, charms. Find out our best offers to this charming islands!